No good pics this weekend…not a lot of work happened on the Old Vic. We helped friends install a walk-in tub on Saturday (my part was installing two new electrical circuits for the pump and heater). Sunday we cleaned up some trash out of the building on the square, and then hotfooted it back so we could see my Dad for a Father’s day dinner. It was also 100 degrees this weekend with very high humidity…so we may have been slightly “less energetic” than normal. 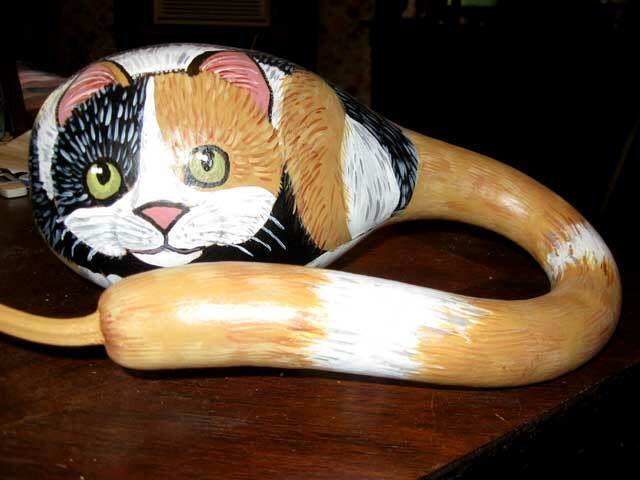 The rare, elusive, cat gourd. (I bought this at this year’s Clarksville Fine Arts Festival).